Well, its been a busy few weeks so I have just taken a two day ‘holiday’ from my mastering studio. I spent the majority of the time writing a new song....In my mastering studio. What can I say, music is a jobby (job/hobby) I love and getting my creativity fix is actually quite rejuvenating. Its funny how writing and creating music excites you to the point where you almost can't stop. You start writing and the next thing you know 8 hours has already passed. It becomes an obsession. You insist on listening to your new song on repeat, no matter how sick the people around you are of hearing it. When you try to sleep you hear your chorus over and over in your head and you think of ways to make improvements. During this particular writing session I noticed that I was writing with my end goal in mind. I was thinking about what I needed to do at the writing stage to make sure my song would sound its best once finished. A mind set that I didn't have when I started producing music and knew nothing about audio engineering. I want to share with you a few of the techniques I used to keep my work in progress along the right track. When I first started making electronic music I wanted everything to sound HUGE. Thats the idea right? Well, I wish someone had told me sooner that the most effective way to achieve a huge sound is with dynamic range and proper gain staging. Want your bass to sound louder? instead of pumping it up a few dB try turning everything else down. Select all the channels in your DAW, deselect the bass, Output and Master fader. Then bring the channels down until you feel the bass is where you want it to be in the mix. A mastering engineer will always ask to receive a mix down with between 3dB to 6dB of headroom. So with this in mind, always try to have the output fader peaking around -6dB during the loudest point of your track. To start with, the Output and Master bus should always be set at 0dB. The Image below shows a mix that is clipping. The red peak reading of ‘0.4’ on the output bus displays the clipping. To fix this select all the channels in your DAW, but deselect the Output and Master bus to leave them at 0dB. Once all the individual tracks are selected bring one of the volume faders down. They will all move down together which means that the balance of your mix will not change. Bring the levels down until the output fader shows the peak level of roughly -6db as seen in the image below. Low frequencies can creep in to your track unnoticed when recording vocals and guitar using a microphone. Below you can see the frequencies that are present on a vocal recording and the eq I used to cut out the unwanted low end. This doesn't change the sound of the vocal as I don't cut into the frequency range of the singer. You can apply this technique to any of your tracks but be sure to not cut the frequency range you actually want to hear. Panning is a useful tool for creating space in your mix. Utilising mono signals can help free up stereo space and increase focus on high energy elements. In many scenarios it is recommended to place your kick, bass, snare and vocals in mono. 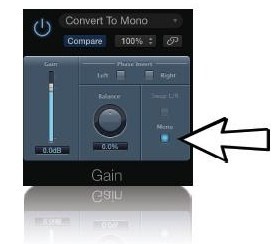 These files may already be in mono but if they're not you can use the gain plugin to sum them from stereo to mono. 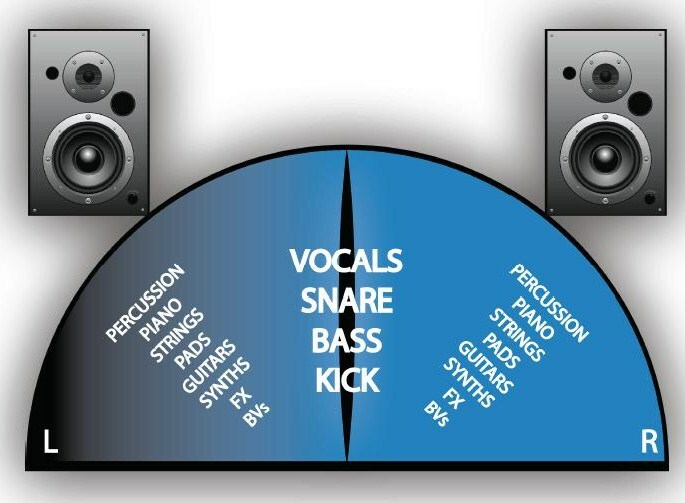 This helps the fundamental elements of your mix become the focus of your music. This also minimises changes to these instruments when you hear your mix in mono. You can use reverb and delay to enhance your vocals without affecting your mono signal. An effective way to do this is by employing a process called parallel processing. This is where you send your audio to a bus and place the reverb on the newly created auxiliary channel. You can then mix in as much reverb as you want without altering your original mono source. Mono is one single channel of audio. The left and right channels of your stereo mix are combined into one signal and sent individually to both of your speakers. A surprising amount of listeners will experience your track in mono. A lot of portable speakers are mono and all car FM radios automatically switch to mono when the signal is weak. Most nightclubs and venues also play music in mono. How should I check my mix in Mono? In Logic, load up the Gain plugin on the master channel. Check the box below ‘Mono’ but be sure to uncheck this box when bouncing your audio. Listen and hear how your mix changes. Some instruments may be quieter or even disappear completely from you mix. This happens due to the sound waves being out of phase. Make sure you only listen in mono through one speaker. If you use two the bass will be hyped giving you a false balance of your mix. Use your reference tracks to achieve a good balance between your instruments whilst listening in mono. Hopefully, these little tips will help you to translate your musical ideas into your DAW the way you envisioned and give you a better final result. Ultimately, the most important part of production is having a great song. But as artists, I believe we must strive to give our fans a fantastic listening experience by presenting our music in its best possible form. Sometimes imperfections in a mix can add to the mojo of the music. On other occasions a track is praised for its impeccably clean production. Having the wisdom to know what to take out and what to leave alone is what will define your sound as an artist. With pre-production complete and crucial decisions made about song structure, lyric edits, and more, "Golden Rule" was finally ready for recording … or was it? Not quite yet. Before we could take the song into the studio, we still had to finalize the instrumentation and arrangement to build the overall vibe of the track. We'd chosen a great drummer/percussionist for the album, and our producer arranged a meeting with him to go over the feel of the song. They each brought some great groove ideas to the table (our producer has a percussion background as well), and the drummer and I played together a bit to lock in the most natural tempo. Hearing how the piano and drums fit together, we decided the song would feel great with an upright bass. We hired a terrific player versed in jazz and rock who brought various textures to the album, and for this track, a jazzier pop feel worked best. We talked through the song, played with some ideas, and then it was time to record the rhythm section. We tracked piano, drums and upright bass live in the studio with each instrument isolated in its own room, separated by glass windows for eye contact. No matter how good your musicians are and or how much you've rehearsed, there's a special magic you're going for in the studio that only comes from letting go and playing until everything "gels" between the performers. Our session was no exception, and once I'd recorded a scratch vocal as our guide for the song, I was free to focus on the nuances of the piano part and how it connected with what the other musicians were doing. Once we had something down that we were all pleased with, I went back and recorded the rubato (out of time) intro and outro sections by myself on piano. With the basics down, we turned our attention to the arrangement. In essence, "Golden Rule" is a song about empowerment, and we wanted a string section to bring out its emotional strength. It needed to sound both fresh and familiar—inspirational without being cheesy, moving without being "over the top." Violinist/composer Kailin Yong listened to our basic tracks and created an arrangement for violin, viola, and cello that built up to great intensity and also provided a sense of comfort and universal acceptance to the listener. Once the arrangement was complete and we were all happy with a midi demo of the parts, we scheduled a recording session for the strings. Kailin played lead violin, joined by Tom Hagerman (DeVotchKa) on second violin, Mackenzie Gault (Flobots) on viola, and Beth Rosbach (Sphere Ensemble) on cello. Our producer took on the role of conductor, with an engineer who specializes in live recording at the board. The string players were charged with bringing more to life than just notes on the page: each musician would also fill the music with the emotions of his or her own experiences from childhood. Though I knew some of them well, I had just met others for the first time that day, so we connected for a bit and exchanged a few brief stories before tracking began. 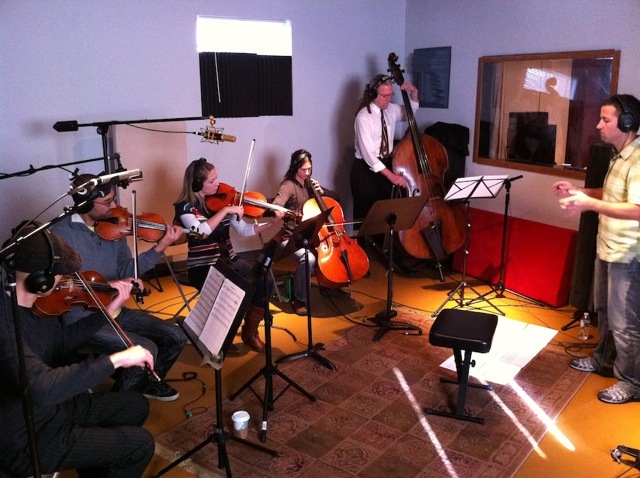 As we layered several takes of the string section, a mini string orchestra evolved before our ears, and I heard the incredible difference it makes to record live musicians. After the strings were finished, it was time to lay down the final vocal. Every singer needs to feel supported by the music, and I realized how much easier it is to deliver a solid, heartfelt performance with a strong, grooving rhythm section and beautiful string arrangement backing me up. We spent some time listening back to the takes and comping the best phrases into a cohesive track that reflected the message and openness of the song. But capturing great performances with great sound is not enough: the complete picture of a song is brought to light by an exceptional mix, and we were fortunate to be working with a producer whose specialty is mixing. He had a vision for each song—and the entire record—from the beginning, as well as a strong understanding of my own sonic preferences. We left him to his own creative devices and returned to find the unique sound and placement of each instrument perfectly treated in a stunning mix that drew the listener in and highlighted all of the most special moments of the song. The final mix of "Golden Rule" (and eleven other songs) then went to our mastering engineer, who processed or "sweetened" the audio to maximize sound quality for both CD/digital and vinyl/analog formats. Since the sound of this music was intimate, sweeping, and highly organic, we chose to master the album for high dynamic range. Unlike many "wall of sound" tracks released since the compact disc began to dominate the industry, compression was used sparingly to keep the quiet parts quiet and the big orchestral parts loud and powerful by contrast. The result is a listening experience of greater sonic depth (and an absence of ear fatigue). "Golden Rule" had completed its evolution from demo to master. From pre-production to arranging, to recording, mixing and mastering, the process was a detailed, lengthy, and enriching one that not only prepared us well for future recording projects but provided a fulfilling creative journey in and of itself.